Perhaps this is not the headline that team boss Jonathan France would have wanted, or even expected, to see at the closing race meeting of the 2005 Championship but this is the situation Embassy Racing found themselves in with just two more races to go, one on Saturday, one on Sunday. One primary circumstance has led to this situation, and that is the pace of the two Ferrari 360s of Scuderia Ecosse - gaining a string of enviable results, racking up the points and securing the championship. Even the Scuderia would have to own up to the fact that they have had the fleetest cars in the championship this season, but this is to take nothing away from the team’s huge efforts and that of their drivers. 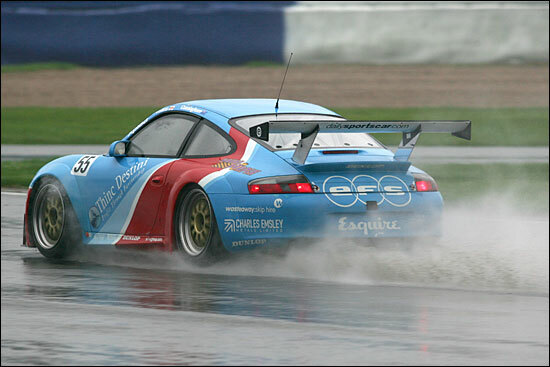 If the Ferrari 360 was the GT2 car to have this year, then the next best thing was certainly a Porsche. 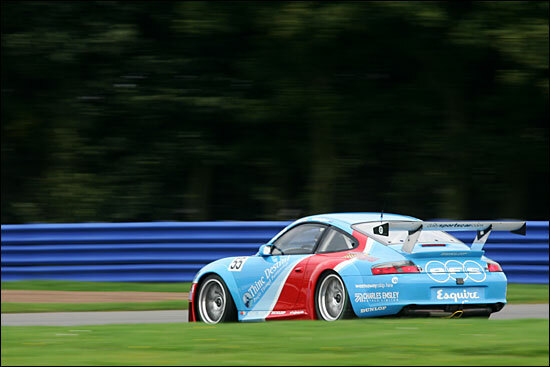 Two teams running these cars have found themselves locked into a very close battle throughout the season – Embassy Racing and Team Eurotech. Embassy has been the more successful of the two teams this season: they are the only ones to have beaten Scuderia Ecosse and achieved that feat in Scotland (at Knockhill) and at Silverstone (on the Grand Prix layout). Eurotech, on the other hand, has been ‘steady’, though when Mike Jordan and Michael Caine are involved, for ‘steady’ read ‘consistently fast’. 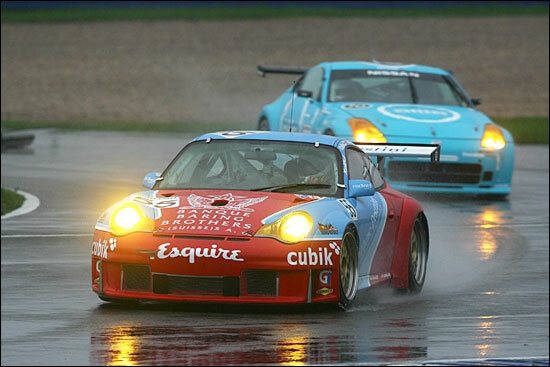 On an overcast Saturday morning, there was no point in the Embassy team ruing lost points at Magny-Cours or elsewhere, they had to look forward, not back, and their job was clear – beat Eurotech in both races, and they would then beat them in both the Teams’ and the Drivers’ Championships. 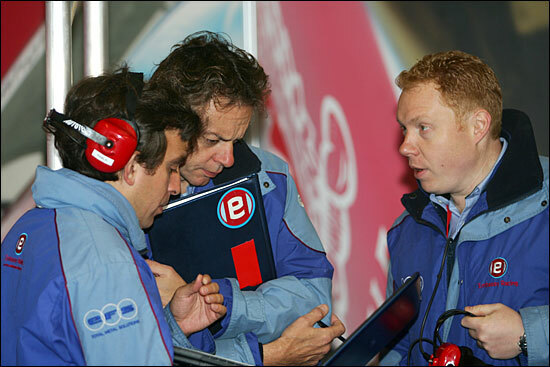 The direction of this focus had been resolved well before the race meeting, Jonathan France having taken his team to Donington Park for some additional testing prior to the race. Unfortunately, the weather was against them and they did not learn a great deal, so it was all to play for come Saturday morning. Geoff Kingston (middle) is seen leading the technical discussion. The early practice session saw Embassy make a bright start, best of the rest behind the Ferraris, albeit 1.8 seconds off the quickest time. More significantly for Embassy, they were 8/10ths ahead of Eurotech with a 1:23.361 versus a 1:24.149. Mike Jordan and Neil Cunningham started the first qualifying session in two very different styles. Jordan was in ‘full attack’ mode, whereas Neil was ‘dawdling’ by race-car standards, weaving to get some heat into the tyres and trying to stay out of the way and find space to attack, once everything was up to temperature. 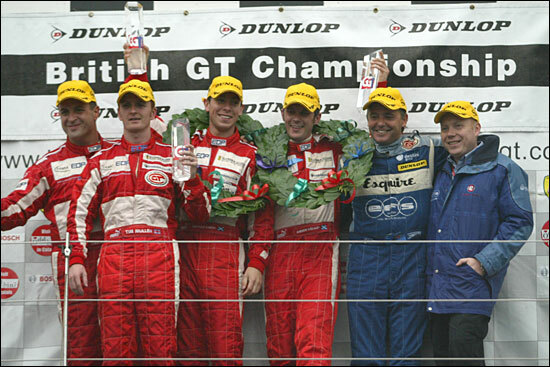 Jordan held the upper hand initially, with a time that would have seen him sitting behind the two Ferraris, with the Ultima between him and Cunningham. By his fourth lap though, Cunningham jumped up to second with a 1:23.741, aided by plenty of shouting from J. France on the pit-wall. This was good enough to see him ahead of Jordan for the rest of the session, and the team’s gaze then fell upon Chris Niarchos’ time, just 5/100ths of a second behind. 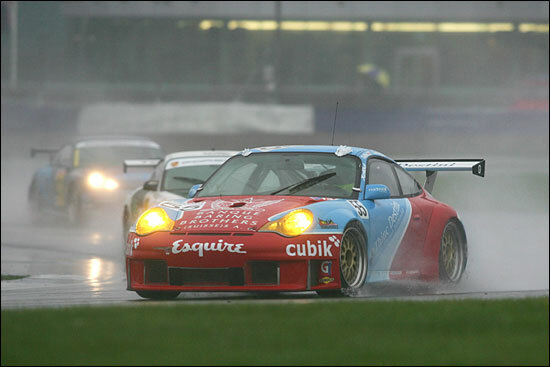 It was worth Cunningham trying his best to eke out a little more of an advantage over this car for two reasons. First, if Neil could stay ahead of Chris Niarchos, then he would have a one-car cushion between him and Jordan for the race, which would take a tiny bit of pressure away. Second, it was not inconceivable that Cunningham and Collins could overhaul Niarchos and Mullen in the Driver’’s Championship – what more motivation could Neil need? The team was relieved to see that the car looked very comfortable on a high 1:23 pace, whereas that was as good at it got for Jordan in the whole session. “In the end I had quite a comfortable cushion, so I just brought it in early to save the rubber, as we weren’t getting anywhere,” concluded Neil. “More of the same please Ben,” was the call from the team. Finishing the session ahead of Tim Mullen would be a tougher prospect for Ben Collins than it had been for Cunningham to better Niarchos, so again the focus was re-set to out-qualify Jordan’s team-mate Michael Caine. The session opened with Mullen and Collins fastest, but Ben Collins left himself plenty of hard work to do, dropping back through the order as he bided his time, waiting until the second half of the session to attack. When he did, his 1:23.704 jumped Caine’s best and was good enough to ensure Embassy would have the upper hand going into both races. It was only good enough for fourth though, as Phil Keen brought the Eclipse Mosler up to third on the grid for Sunday’s race. A late improvement for Caine, with a minute of the session remaining, saw him only a tenth away from Collins. The racing was clearly going to be tough. This would be a very tense weekend for the whole team. A single mistake could decide the outcome of both championships. Unfortunately, it seemed that it would take quite a large mistake for Mullen and Niarchos to concede second place in the Drivers’ Championship however, Mullen in particular looking very strong indeed around the International circuit layout. Embassy needed all the good luck they could get to secure their goals, and at least this circuit, in Grand Prix form at least, is the one that handed Embassy that second win of the season back in August. There was a confident mood in the camp once the car had finally been allowed back into the garage – strict pitlane procedures and a busy timetable meant the team didn’t have quite as much time as they would have liked to prepare the car for the half-past four race. Only an hour before the race, it looked like everyone was waiting for a night race – grey and miserable all day had morphed into a threatening, yet featureless, sky. 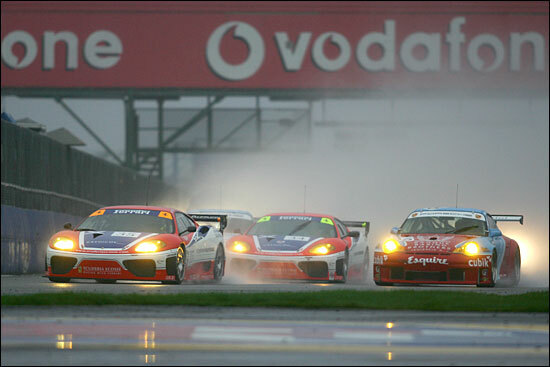 Spots of rain became a steady drizzle and by the time the field took to the track, it would be full wets for all. As the pace car peeled off into the pits, it was a race-start that was full of energy, the lead four bursting over the line in a tight ball of spray. Neil Cunningham stayed out wide, trying to keep a clear view, whilst Jordan dived to the inside, hoping Niarchos would make a move on Cunningham into Copse, and that he would be able to follow him through. As the leaders streaked into Becketts, the positions remained unchanged, but by the end of lap one, Jordan had passed Niarchos. For the first couple of laps, the lead four became more strung out, but then Niarchos, learning his lines from Jordan, found his rhythm and reeled his ‘tutor’ in to re-take third on lap five. It was hard to work out whether that was good news or bad – it put Eurotech further down the team points scoring positions, but then it eroded some of the Embassy drivers’ points gain on Niarchos and Mullen. None of this was affecting Cunningham though, as he lapped in isolation a quarter of the way into the race, eight seconds down on Kinch but a comfortable 13 seconds ahead of Niarchos and Jordan. The rain became heavier and Cuningham pressed on, not letting Kinch stretch his lead, and on occasion taking some substantial chunks out of it. All the while, Embassy stretched away from Eurotech, by some two seconds a lap. As the driver change window opened, Scuderia Ecosse opted to get Niarchos in first to hand over to Tim Mullen. Kinch pressed on for a further two laps until his pit was clear, then brought the Ferrari in to hand over to Kirkaldy. Cunningham took the lead, and Jordan stayed out too, trying to make the most of the clear track ahead, and hoping his team-mate, Michael Caine, would leap frog Mullen during the pitstop sequence. 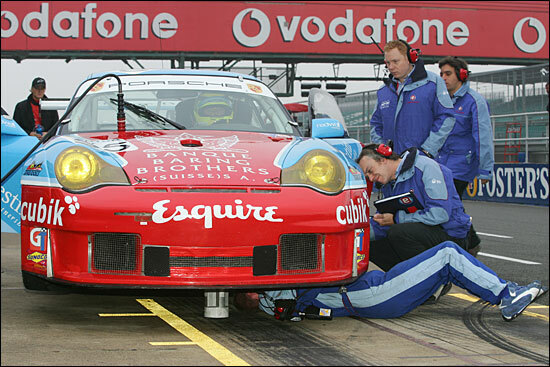 The rules state that the car should have arrived at its pit box before 37 minutes of the race has passed, but Cunningham arrived some ten seconds too late, and the team incurred a stop and go penalty. This was a great shame, as Neil had been lapping quicker than Kirkaldy, the newly installed Scot building the feel of the Ferrari in the wet conditions. Still, it was unlikely that Embassy would have made up the eight second deficit, particularly after a momentary stall from Ben Collins as he tried to rejoin from the pits. As the car shunted away onto the pit exit, the shrill bark of the leading Ferrari streaking past on the other side of the wall meant Collins would rejoin second, with Mullen 26 seconds behind. The Eurotech rivals, so easily dismissed just ten minutes earlier, were now separated from Collins by just a few backmarkers. Michael Caine had initially been held up as the first car in the train behind the safety car, but he was released with just enough time to make the lap back up again, so as the race went green again with three minutes to go, it was to be a two lap sprint to the finish. It was unfortunate that the race ended in circumstances of finger-pointing, but it was only first blood to Embassy. Both teams are locked on 60 points apiece and both sets of drivers are still only separated by four points, so nothing has been concluded in this battle as yet. Mullen and Niarchos have not quite clinched second in the Drivers’ Championship but it is only mathematics now that prevents them from having done so, unless Embassy have some extraordinarily good luck in Sunday’s race.